Lynn Slater began playing violin in grade school and eventually switched to viola at Elgin High School where she studied privately with former Elgin Symphony Orchestra member Jean Hove. After graduating and junior college, Lynn married, moved to central Illinois and started a family, but always kept playing in various local community and college orchestras, pit orchestras, and churches. Lynn and her husband moved back to this area in 1986. Lynn is the coordinator of admissions and public relations for the School of Music at Northern Illinois University (www.niu.edu/music) where she works with all incoming students on both the undergraduate and graduate levels and assists them in their goal to becoming music majors ‒ from their first contact to the university to their actual entrance. She keeps in contact with the alumni and donors as well as coordinates all public relations for the School of Music. She is also a freelance liturgical musician, playing at many weddings and local church events. 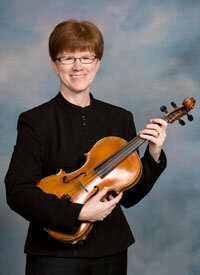 She is the principal violist for the Diocese of Rockford and is privileged to play for many liturgical events in the diocese. She has been a proud member of the Kishwaukee Symphony Orchestra since 1988. Her favorite composers are Prokofiev, Dvorak, and Beethoven. She also enjoys composers Bear McCreary, Philip Glass, and Howard Shore. Lynn and Dave have grown three children: Jenny (and Jim), Erin (and Dave), and John. They also have four beautiful grandchildren: Dean, Cecilia, David, and Maggie Marie.